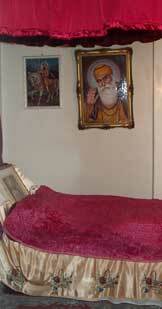 This is a bedroom for Sri-Guru Granth Sahib Ji's rest room. The book is kept on a bed, in a special rest room at Temple Milton Keynes and brought out in the morning. A baptised Sikh must always sit in the presence of Guru Granth Sahib. Every morning the book is taken out from room, carried on the head of baptised Sikh, to the centre of the other room and is put on the throne. Evening time the book is closed, put into the special rest room. The book is always covered with clean clothes.